Fiontan plays cricket at Bedminster CC for the U13s Competing in both the North Somerset Youth Cricket League and the Bristol Youth Cricket League. The Team won both leagues and were presented with medals and Trophies at the recent Youth presentation evening at Bedminster CC. Fiontan also plays for the Bedminster C XI senior team, who also won their Bristol and District league this year. Well done Fiontan! Congratulations and thank you to everyone who entered the competition. With such a very high standard of jolly and colourful designs, it was so difficult to choose a winner but the results are here! Our Winner is Prerena Nerlige Prasl 9ID with her jolly Cotham Elves. Click here to see Prerena’s design. Our Runner up is Salu De Oliveira, 9GC with his pop up Christmas card and lovely words. Unfortunately we cannot replicate the pop up version here but trust you will agree it is a lovely design. Highly Commended Students include: Stella Hutchins 8BSA, Amy Howe 9ABI, Patrick Rolt 7JPG, Martha Pykett 7JPG and Daisy Dimbleby 7CBR. Click here to see the collage of their wonderful designs. As this was a House competition 3 of the entrants received points for Gamma, 2 entrants for Sigma and 1 entrant for Omega - very well done! Each student will also receive an Amazon voucher as a prize and a pack of cards using their design. Commissioning Consultation Event for Professionals working with Children and Families, 3 December 2018, 4.30pm to 6.00 pm at City Hall, College Green, Bristol, BS1 5TR. As part of the commissioning process Bristol City Council are engaging in a public consultation ending on 8 January 2019 with professionals, children and young people with SEND and/or disabilities, and their parents and carers. This event is an opportunity for professionals to share their views on how the SENDIAS service should operate going forward. May we remind Parents and Carers that the Lost Property Coat Rail is located at the Student Reception side of School Parents and Carers are welcome to come in between the hours of 08.30 - 3.30 (Monday to Thursday) and 08:30 - 3.00 (Friday). Students are welcome to come and retrieve their coats at the start of the School day or at break times. This week our Lost Property Office had several V neck jumpers handed in that had been found around the School. Unfortunately we are unable to return them to their owners as none of them are named. Please name all items of Uniform so we can trace the Student and return the item to them. Thank you to all the those Parents/Carers who attended appointments with the Year 7 form tutors on Thursday 22 November. We were pleased to see so many of you on the day. 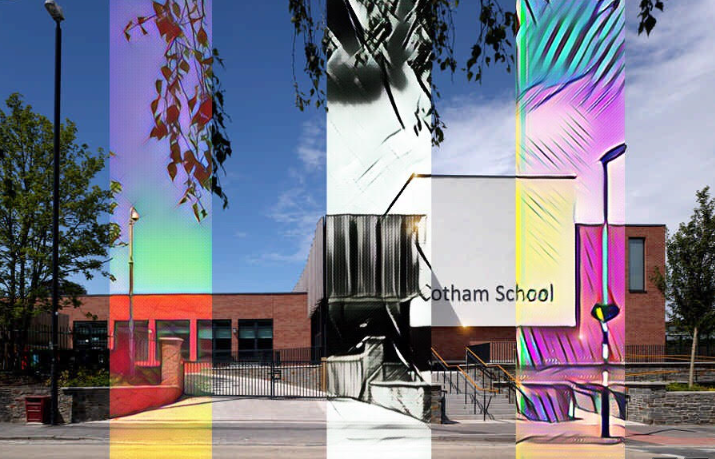 The meetings were a chance to discuss how our Year 7's have settled in, to talk through any concerns, and to plan how home & school can work together to give students the best possible start at Cotham. Many thanks to everyone who took a moment to complete our questionnaire on the day. This is a valuable opportunity for you to provide feedback to the school. It is still possible for you to complete the questionnaire online by clicking here. We have our Year 10 Parents Evening on Thursday 29 November. Bookings for this are now well underway and filling up fast so please do book early to avoid disappointment. Upgrade has now launched for all students who we believe will benefit from extra support in the run up to mock examinations in January. Initial student feedback has been really positive, with many finding the time useful and productive. Students say they find Upgrade particularly helpful for organisation, time management and in the development of effective revision methods. They can access support from both staff and peers in each session. Affected students have received new timetables with their Upgrade lessons added. Please ask your child to show you their timetable and support our staff by reminding them they must attend. Lots of students feel worried and stressed in the run up to exams. We recommend students keep a good sleep schedule, eat well, get outdoors and do regular exercise to support their well-being. A reminder for Year 11 (both sides): the Maths Mock Exam Paper 2 will be on Friday 30 November, Periods 1-2. For this exam students should ensure they bring a calculator, compass and protractor, as well as all the usual equipment. Maths specific revision advice is contained within the recent Y11 parent info presentation here and the recent letter to Y11 parents here. Year 12: Many thanks to all parents and carers who attended the Family Consultation Day last Wednesday. We hope it was as useful experience for you. If you were unable to attend then your son/daughter's form tutor will be in touch with you soon. Year 13: Your son/daughter's Progress Review will be emailed out to you soon. Should you have any concerns or queries please contact your son/daughter's form tutor to discuss. UCAS - please remind your son/daughter that they should be arranging one to one meetings with their form tutor to go through their personal statement. The deadline to "pay and send" is Monday 3 December. This allows Mrs Kempt to check their application, upload their reference and send to UCAS. Year 12: Core Programme this week is on wellbeing and mental health - Kooth the online counselling service will be presenting this session. DSA - The Disabled Student Allowance is a brilliant scheme to support SEND students and those with Medical and mental health needs at university. A representative from Contact Associates will be coming in on Monday 3 December 5pm - 6pm to explain what is involved. There will be letters going out soon. Wellbeing drop in on Thursday lunchtime continues in G208 - all are welcome. Congratulations to Reuben West (10KBO) who has qualified for the Bristol Schools Swimming Finals in the 50m freestyle, 50m butterfly and 50m breaststroke by winning all his heats. He also set a new Bristol Schools record for the 50m freestyle 25.29secs. Year 7 netball festival at Clifton Sports Centre. Congratulations to Grace in 7DS for their Drama homework. 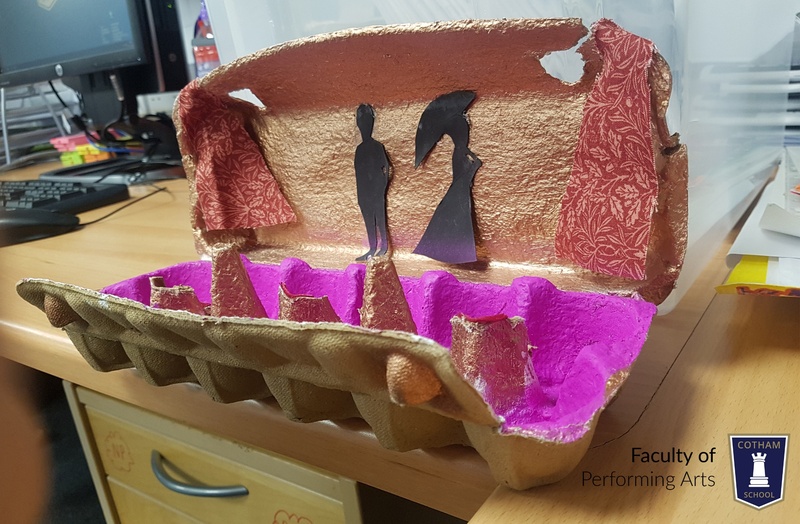 We were all very impressed with the creative use of an egg box to create "the world's smallest theatre, showing Pride and Prejudice". Click here to view. All tickets 20p. Tickets on sale in the Hub form Monday 10th December. From Monday 10 until Friday 14 December. This week, Omega house has launched a whole school Christmas Collection initiative. We have been focusing the house assemblies on the ideas of how, in our local community, there are many who are much less fortunate than ourselves and do not get to enjoy some of the things that we take for granted. Small acts of kindness can go a long way and as a school collective, we can help others at this time of year when we are all looking forward to spending time with our families and appreciating the things we are grateful for. Donation boxes will be found in Student Reception, The Hub, and Omega prefects & reps will also be collecting from tutor groups. Congratulations to all! Thank you for being outstanding members of the Omega community and making a difference around the Cotham site. On a final note, Sigma have introduced a new water fountain with an aim to cut down single use plastic waste, we have started to sell our own Omega water bottles for £1.30 not for profit. We have had a lot of interest in these and they can be purchased from myself in Science, room C203. These last few week have been very busy for Gamma with our House assembly and lots to celebrate. shared reasons to be grateful and explored the rising problem Bristol is experiencing with homelessness. Omega is focused on helping the local community and are therefore leading the collection for the homeless. Miss Madge would also like to congratulate all of the students who have taken part in the photography competition for the Cotham Newspaper (google classroom code- qk1qkj). The winning student happens to be a Gamma student- Rose Carolan 8SD/IJ with the edited photograph seen here. She will receive a £5.00 amazon gift voucher as well as being published on the front page of the newspaper. There were tonnes of great entries but the creativity shown by Rose was exemplary. Well done! Responding to the unprecedented crisis of 65 million displaced people. Click here to find our more about events with Rissa Mohabir - Author of ‘Under the Shade of a Tree - Somali Women Speak.